'Kailangan Ko'y Ikaw' Starring Kris Aquino, Anne Curtis, and Robin Padilla Premieres on January 2013! 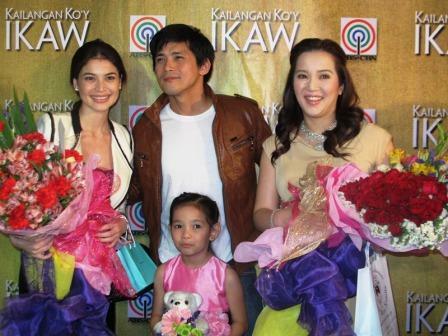 ABS-CBN’s highly-anticipated Primetime Bida drama series “Kailangan Ko’y Ikaw” starring Kris Aquino, Anne Curtis, and Robin Padilla will premiere on January 21, 2013 (Monday). The series, which is directed by Malu Sevilla and Bb. Joyce Bernal, is a compelling tale of two sisters Ruth (Anne) and Roxanne (Kris) who both fell in love with one man, Bogs (Robin). Also featured in “Kailangan Ko’y Ikaw” are Tirso Cruz III, Ian Veneracion, Smokey Manaloto, Emilio Garcia, Lito Pimentel, Xyriel Manabat, and Daniel Padilla who will portray the role of the young Robin.